A protective aqueous low VOC surface treatment. Available as a clear treatment that reduces swelling, wood rot, moisture absorption and discoloration. 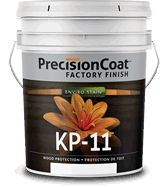 Precision Coat KP-11 is a permanent wood treatment for interior surfaces – can be used on wood components and engineered wood components for long term protection against discoloration and stabilization issues due to moisture. Not for use on visible or exposed surfaces. Comes in formulas for in situ and machine application. KP-11MF is a ready to use clear formula for machine coat application.